If you have overwhelmed by the attraction from different stroller brands on today’s market, then, Contours Red Velvet Options Elite Tandem Stroller may satisfy you well. The model is designed for families with twins or more than one kid. It has the perfect combination between safety and comfort in long run. For the excellent performance, the smart tool deserves to rank 4.5 out of 5 stars. Let your children enjoy wonderful experience when riding the stroller to the shopping mall or for a walk. We ensure that it is a right investment for long-term goals. Contours stroller appears in the plenty of color options, including Sand, Envy Green, Red Velvet and Laguna Blue. Among all of them, red velvet attracts most of parents’ eyes thanks to the appealing appearance at the first glance. Coming with 47 pounds in weight, it is rather compact than other double strollers in the same category. When folded, the stroller is so portable and takes less space for movement and storage. Thanks to this feature, it fits most of car trunk in an effective way. The stroller is designed to withstand 40 pounds of weight capacity per seat. It is completely easy to fold the stroller in quick time without any difficulty. Let’s have a close look at Contours Red Velvet Options Elite Tandem Stroller. It is evidence that the tool equips a great number of fabulous features of an excellent double stroller. This allows you to carry small children in tight corners or limited spaces. Flexibility is one of the most impressive features of the tool, which helps it run smoothly on different types of terrains. Which are factors leading to this result? Wow, it comes from smooth wheeling mechanism and 10 inch rubber to efficiently solve problems on the sidewalk. You will find it easy to control the stroller even in rough surfaces due to shock-absorbing rubber tires. Besides, all tires of the tool are covered by high-quality materials to strengthen its longevity and comfortable rides. Comfort is another great benefit of the stroller. Children have chance to select endless seat options such as car seat for twins, one seat for single, various seat directions and more. The design of 3 positions recline seat offers deep short naps when your babies get tired. In addition to durable materials of seat, it is padded to improve the incredible comfort, especially for long walk. Parents could be rest assured to let their babies safely sit on this stroller. It equips expandable canopies to protect small users from UV rays and other weather conditions. There are mesh peek-a-boo windows available to provide a great view to your babies. To ensure the safety of your babies during the strolling process, you should consider these factors below. For example, remember to supervise your babies all the time sitting on the stroller seats. You had better not to store your belongings in incorrect places such as canopy, handle and seat. Avoid using this stroller on escalators or stairs. Besides, set the tire brakes when parking the stroller. 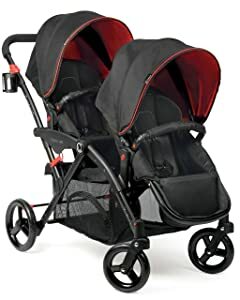 All in all, your babies actually love Contours Red Velvet Options Elite Tandem Stroller for many reasons. The model comes with sturdy design and excellent quality to bring remarkable comfort and safety to small children. If you are looking for a perfect stroller for your home use, Contours is a reliable brand to trust.